No software program is perfect and so patches are common, even years after a program has been released. The more popular a program is, the more likely rare problems occur, and so some of the most popular programs in existence are some of the most patched. A collection of usually already-released patches is often called a service pack. Do I Need to Install Patches? 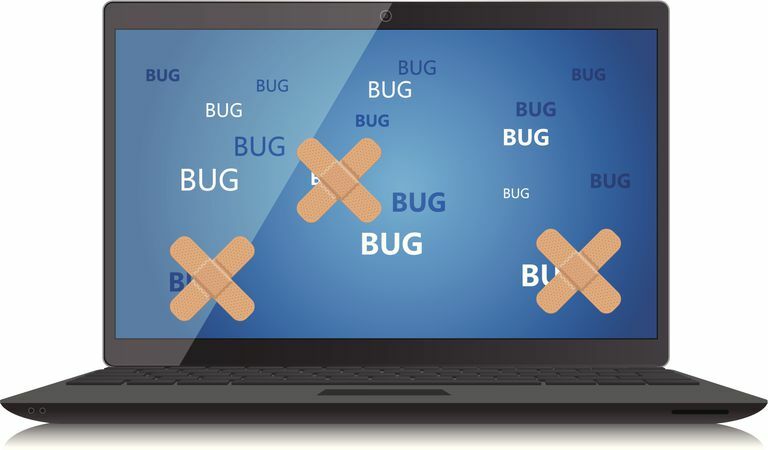 Software patches normally fix bugs but they can also be released to address security vulnerabilities and inconsistencies in a piece of software. Skipping over these important updates can leave your computer, phone, or another device open to malware attacks that the patch is intended to prevent. Some patches aren't so critical but still important, adding new features or pushing updates to device drivers. So again, avoiding patches will, over time, leave the software at a greater risk of attacks but also outdated and possibly incompatible with newer devices and software. How Do I Download & Install Software Patches? Major software companies will periodically release patches, usually downloadable from the internet, that correct very specific problems in their software programs. These downloads can be very small (a few KB) or very large (hundreds of MB or more). The file size and time it takes to download and install patches depend entirely on what the patch is for and how many fixes it will address. In Windows, most patches, fixes, and hotfixes are made available via Windows Update. Microsoft typically releases their security-related patches once per month on Patch Tuesday. While rare, some patches can actually cause more problems than you had before they were applied, usually because a driver or a piece of software you have installed has some kind of issue with changes the updates made. Here are a number of resources we've put together that should help you understand more about why Microsoft issues so many patches, why they sometimes cause problems, and what to do if things go wrong. Patches pushed by Microsoft for Windows and their other programs aren't the only patches that sometimes wreak havoc. Patches that are issued for antivirus programs and other non-Microsoft programs cause problems as well, for similar reasons. Botched patching even happens on other devices like smartphones, small tablets, etc. Patches for software that you've installed to your computer, like your antivirus program, are normally downloaded and installed automatically in the background. Depending on the specific program, and what type of patch it is, you might be notified of the update but often times it happens in the background, without your knowledge. Other programs that don't update regularly, or don't update automatically, will need to have their patches installed manually. One easy way to check for patches is to use a free software updater tool. These tools can scan all the programs on your computer and look for any that require patching. Mobile devices even require patches. No doubt you've seen this happen on your Apple or Android-based phone. Your mobile apps themselves get patched all the time, too, usually with little knowledge by you and often times to fix bugs. Updates to the drivers for your computer's hardware are sometimes offered to enable new features but most of the time were made to fix software bugs. See how to update drivers in Windows for instructions on keeping your device drivers patched and up to date. Some patches are exclusive to registered or paying users, but this isn't very common. For example, an update to an older piece of software that fixes security issues and enables compatibility with newer versions of Windows may be available but only if you pay for the patch. Again, this isn't common and usually only happens with corporate software. An unofficial patch is another type of software patch that's released by a third-party. Unofficial patches are typically released because the original developer has quit updating a piece of software or because they're taking too long to release the official patch. Much like computer software, even video games often require patches. Video game patches can be downloaded just like any other type of software -- usually manually from the developer's website but sometimes either automatically through an in-game update, or from a third-party source. The term hotfix is often used synonymously with patch and fix but usually only because it gives the impression of something happening quickly or proactively. Originally, the term hotfix was used to describe a kind of patch that could be applied without stopping or restarting a service or system. Microsoft usually uses the term hotfix to refer to a small update addressing a very specific, and often very serious, issue.